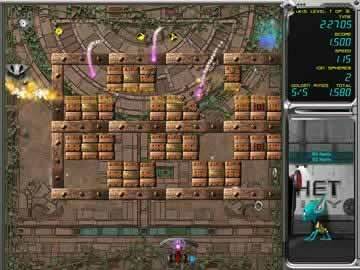 Ricochet - Infinity Game Review - Download and Play Free Version! Ricochet Infinity is the ultimate sci-fi Breakout game with virtually unlimited levels and non-stop action! Can become tedious to try to clear levels entirely. In Ricochet Infinity, you will trek across 216 awesome levels earning new ranks in the Galactic Tournament, by yourself or with a friend. Play the re-energized Ring Game, winning new balls and ships with unique power up combinations. Choose to play with whatever ship you have unlocked. Control your ball with the wildly innovative Recall feature - once you've tried it, you can't go back! Travel to the stars and beyond in your glorious quest to become the Ringmaster Grand Champion! More Hours of Game Play Than You Can Possibly Handle! Need more levels? There are thousands of user created levels you can download for free within the game, giving you virtually endless game play! Ricochet Infinity puts you in control of a bumper ship, using your ion sphere (ball) to smash bricks in space. 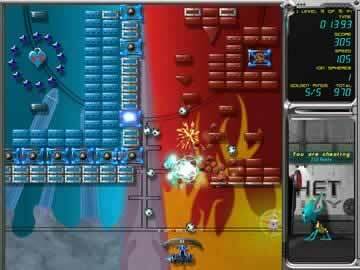 Through the levels you will experience 2D Breakout style action in levels that move and change as you go. Along the way you encounter a large variety of maps and worlds all full of interesting setups for you to smash. Several different modes are available to play. The modes are all played the same but each offers unique levels. 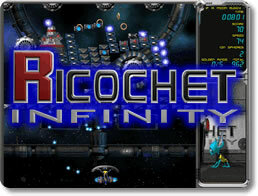 Ricochet Infinity offers 145 levels to experience. Episode 2 The Delta Quadrant offers an additional 70 levels on five different planets. The last mode offers literally thousands of maps. Users can create maps with the supplied editor and post them online, the third mode gives you access to these maps. Collecting power-ups enhances your ability to clear levels. You can receive items like a wider bat, a laser guide for your ball that shows you where it will go, or weapons like a missile launcher. There are tons of different power-ups to get that help you along the way, but watch out for the bad power-ups because they make your life harder. To pass each level you will have to destroy all the bricks that are on that level. Another item you can collect in each level is golden rings. There are five rings on each level and collecting them levels you up. Leveling up unlocks new ships with different special features like laser cannons or bumper assist. Also new ball styles are unlocked. Ricochet Infinity offers something that few Breakout style games offer, multiplayer. A “Mouse Party” allows you to play with a friend. You each need a mouse plugged into the same computer. Having multiplayer on a game in this genre is rare. The ability to play with a friend is a good addition to any game and this game offers great multiplayer action. The graphics in the game are good. All the levels are well detailed for a 2D Breakout style game. The addition of moving pieces makes this game even better visually. In one level you will be smashing a spider shaped with bricks. The sound really doesn't add much to the game but it also doesn't detract either. This game really only lacks in a few areas. Clearing the levels can be difficult and tedious. Every brick that can be broken must be broken before you can advance to the next level. This can be very challenging to accurately control the ball. In several cases blocks will be behind other objects, timing your ball to an opening is also another obstacle. You might find yourself spending ten minutes trying to break one box. With literally thousands of levels to play this game will never get repetitive. Easy controls and a great space theme will increase the playability even farther. Everyone can enjoy playing Ricochet Infinity. Traveling from planet to planet and even creating your own levels makes this a great game. Download the trial and you will be instantly hooked. View a collection of highlights including the creative levels, various weapon upgrades, and brick-busting fun you can find in Ricocket Infinity.